As well as two fresh new trackers, Fitbit just announced a new Special Edition Gold series Fitbit Blaze alongside new bands and a gold accessory if you already own a Blaze. The 22-karat gold-plated, stainless steel Blaze has a "satin finished" frame and comes with a slim, tapered pink band. It's $229.95 but if you already have a Blaze, you can buy just the gold-plated frame, with either a pink or black band, as a $99.95 accessory. Also new are a silver stainless steel frame with a slim camel leather band for $99.95 and individual nylon bands in khaki and olive colours which Fitbit is calling its leisure collection. Existing Fitbit Blaze users are also being treated to a couple of nice software updates this September - firstly, onscreen notifications for third party apps which did pop up on Android in March but not iPhone. That means you'll get alerts for apps including: WhatsApp, Facebook, Skype, Slack, Instagram, SnapChat, WeChat and Gmail. You can, of course, customise which alerts you get. There's also new five new clock faces, to add to the existing four, and reminders to move for two or three minutes an hour are now on the watch itself. 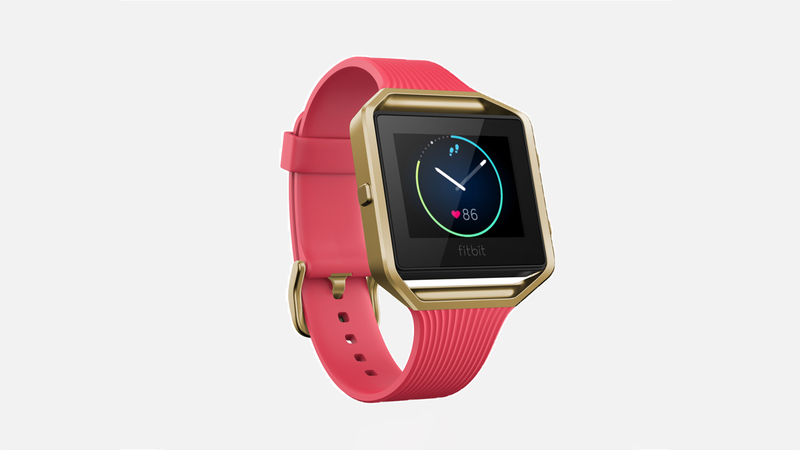 The new gold-plated Blaze (and a similarly gold-plated Fitbit Alta) are up for pre-order direct from Fitbit today. The new devices go on sale from 30 August in the US at Amazon, Best Buy, Target, Bloomingdale's and Nordstrom with international availability coming in September. The Blaze update will roll out in September.